A piston compresses the fuel/air mixture, which is then ignited by the spark plug. The ensuing explosion violently forces the piston down, which spins the crank. The rotary motion passes through the crank to the clutch, to the transmission, to the sprocket, to the rear wheel. The end result of the piston being pushed downward by the expansion of burning gases is forward motion. Then, as you would expect, it is thrust back upwards by the circular motion of the crank—where it is greeted by another explosion. If the alloy mix isn’t spot-on, the material can become hard and brittle. If there is a problem area—hot spot, partial seizure, too much clearance—a cast piston is much more likely to crack and explode. Many works bike pistons are semi-forged (also known as squeeze-forged, hotpforged or pressure-forged). Semi-forging is a process that casts the molten aluminum in a pressurized environment. Combining some aspects of casting with the high pressure of forging produces a piston that can have the weight, silicone content and controlled piston swell of a cast piston with the strength of a forged part. Some OEM four-stroke pistons are semi-forged. Another plus of a semi-forged piston is that it requires less machining than a forged piston. Yes. Often when race teams are testing potential piston designs, they don’t want to spend the $10,000 to $15,000 setup charge to produce a handful of one-off forged test pistons. So, they machine a piston out of a solid block of billet aluminum. Thanks to modern five-axis CNC machines, these billet pistons can be built to custom specs, thicknesses and designs—and they can be raced. Billet pistons costs about $500 each, but it makes sense to a race team. 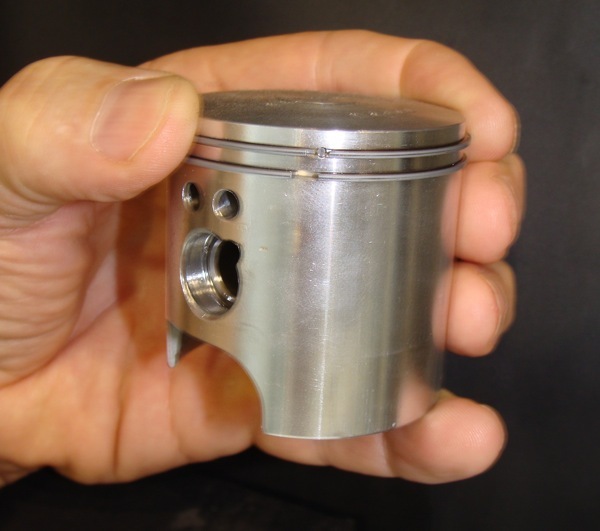 No one sells billet pistons, although since the technology is only a couple of years old, some company may sell them in the future. Yes, because we are talking about reciprocating mass. A piston goes up and down 200 times a second. Even a small weight difference is noticeable—both on the track and on the dyno. 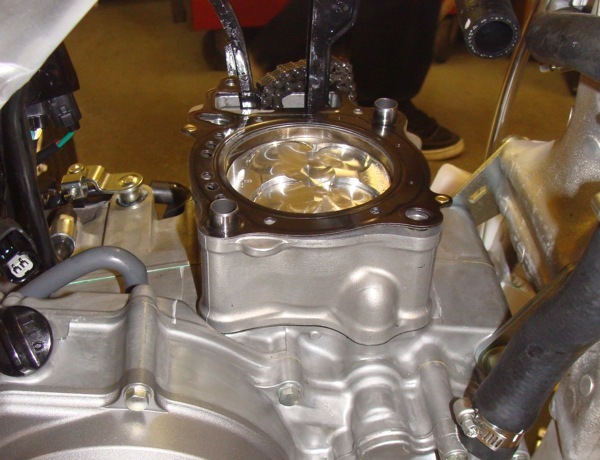 A lighter piston has better throttle response and more snap. 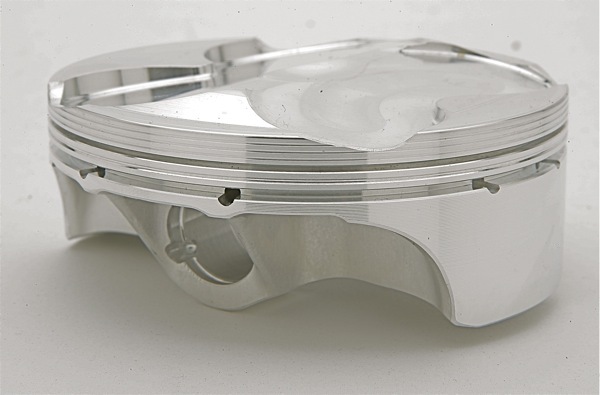 Every factory team runs a forged piston—unless they are running a works billet or semi-forged piston. Vertex is the OEM piston for KTM, but they have been known to run Vertex, CP and Mahle pistons. Team Honda runs either a JE piston or a works piston. 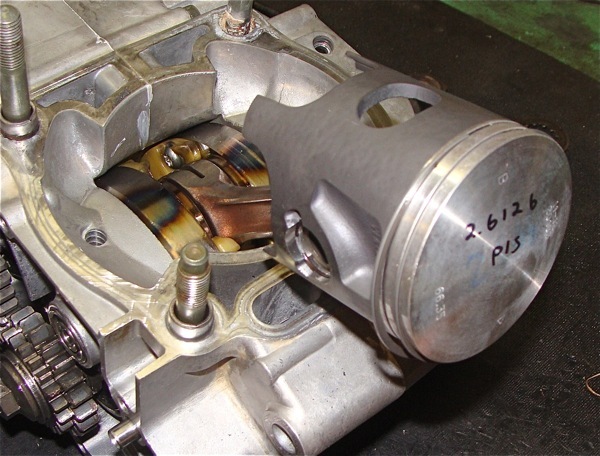 Suzuki runs a CP piston. Kawasaki and Pro Circuit both used to run Pro Circuit-designed JE pistons, but we don’t know what Kawasaki is running now since their falling-out with Pro Circuit over exhaust pipes. Most Yamaha race engines use Cosworth pistons. The piston in your bike goes up and down 200 times a second. How long would you last if you had to go up and down that many times? Your bike’s piston is working hard; replace it before it blows.